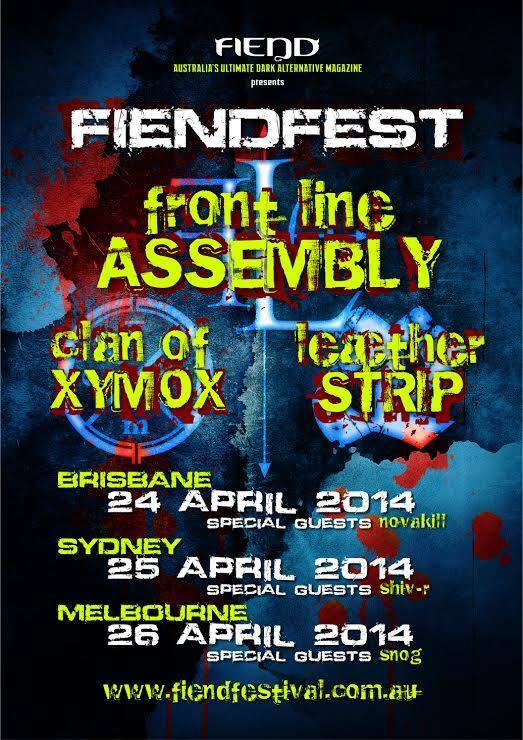 Fiend Fest, Australia's only crowd funded and crowd led festival of gothic, industrial and alternative music, culture and fashion is returning for 2014 and this time it expands, with a Perth date just announced! Featuring three of the biggest international names in the worlds of industrial, electronic and darkwave; Front Line Assembly, Leaether Strip and Clan of Xymox, along with a stellar cast of locals including Snog, Cold Divide, Shiv-R, The Dark Shadows, Noveaux, Viral Milennium, Novakill, Keller Kinder and many more to be announced, Fiendfest crosses the country Anzac weekend with shows in Brisbane, Sydney, Melbourne and Perth. Front Line Assembly is the primary focus of Vancouver-based musician Bill Leeb. A former member of Skinny Puppy, Leeb moved on to form FLA in 1986 with Michael Balch, releasing some cassettes (since released as Total Terror I & II) which paved the way for their 1987 releases: The Initial Command, State of Mind and Corrosion. In late 1988, they recorded the mini-LP Disorder, since combined with Corrosion and released as Corroded Disorder. Their 1989 release, Gashed Senses and Crossfire, further cemented their popularity in the industrial scene, and prompted their first world tour. By 1990, Balch had departed and Rhys Fulber rounded out the duo, releasing Caustic Grip. But it was two years later when the duo released what for many has become the genre's crowning moment, the classic album Tactical Neural Implant, which to this day still defines the best of industrial music. Clan of Xymox, also known as simply Xymox, formed in the Netherlands in 1981. Clan Of Xymox featured a trio of songwriters - Pieter Nooten, Ronny Moorings and Anke Wolbert - and gained success in the 1980s, releasing their first two albums on prestigious independent UK label 4AD, a third and fourth album on a major US label and scored a hit single in the United States with Phoenix of My Heart. Early pioneers of the dark and moody electronic music known as darkwave, their 1980s releases included synthpop/electronic dance music. After the departure of Nooten and Wolbert in the early 1990s, their music turned increasingly goth. Tracks like Jasmine and Rose and A Day are still popular floor fillers at goth clubs today. Discovered by the German techno artist and producer Talla 2XLC, Leæther Strip quickly built a buzz as one of the most exciting emerging acts in Europe in the early 90's. After a very successful Japanese Bodies 12", the debut album The Pleasure of Penetration, released in 1990, instantly established itself as a classic, featuring a punishing rhythm pace and aggressive electronic style with distorted vocals that he has since become renown for and that is often described as Leæther Strip’s “trademark". While reminding the powerful angst seen in other electro acts such as Front 242, Skinny Puppy or even Nine Inch Nails, Leaether Strip rapidly got the reputation to be carrying a deeper message and meaning in his work through his very personal intense music and the sometimes emotional, sometimes political dimension of his lyrics.